Every year, I sign up for one main race so I can focus all of my training, efforts and attention into that one race. This year, that race for me was the North Face Endurance Challenge 50K in Kettle Moraine State Park. This race would be my first ultra marathon as well as my first official trail race, a nervous and exciting challenge I could take on to test my limits and go further than I had before. Signing up for one major race per year gives me the opportunity to really focus my training on that one goal and provide myself with an even larger sense of accomplishment without overbooking myself. While I do tend to focus on one main event each year, I find myself adding in a few extra races beforehand, to test my training progress. For that reason, I signed up for the Dances with Dirt Devil’s Lake Half Marathon, as I figured some trail race preparation might be to my benefit come the “big show”. Leading up to the North Face Endurance Challenge, I was struggling with my training and having a hard time finding the motivation to get out and run. As I got deeper into my training, I began to enjoy other forms of activity outside of running, and when I had to run I kept saying to myself, “This is not fun, why am I here?”. It was a run out at Blue Mounds State Park that I kept thinking to myself “I just want to be done.” I loved the incredible scenery out there and the single track trails, but appreciating the experience was harder than it used to be or should have been. It wasn’t necessarily that I was physically tired, it’s that I was mentally exhausted and uninterested. The mental aspect of running is so much more influential than what it’s given credit for. I felt I had to either change my mentality and find motivation, or I had to consider a new alternative goal race to the 50K. I had never dropped out of a race before, or even transferred to a lower distance. To me, that meant failure in running as this was my event I was “supposed” to do and succeed in. It got to the point where I had to ask myself who I was doing this race for and realized it was no longer for myself. It was following the Dances with Dirt Devil’s Lake Half Marathon that I realized dropping out of the race or transferring distances was what I had to do, which was a decision I did not want to admit to myself. I had let the impressiveness of doing a 50K outweigh why I love to run. I realized that it was a blast running the trails at Devil’s Lake because I enjoyed the company of other runners, and the scenery, not because I wanted to compete at races. I choose to run because it reminds me of how able my body is and how grateful I should be for that ability. Running is something that gives me immense amounts of happiness, but only if I do it for myself and no one else. I love exploring the trails and the opportunity to be at peace with myself. At that point in training it had become a sort of “homework” I had to get done in order to make the race “deadline”. I did end up deciding to transfer to the half marathon at the North Face Endurance Challenge, recognizing that while this wasn’t the ultra marathon goal race I had hoped for, it was still something to be proud of. I had an awesome time during the race and recognized that I actually felt good racing rather than doing a longer distance well beyond what I was prepared for, physically and mentally. 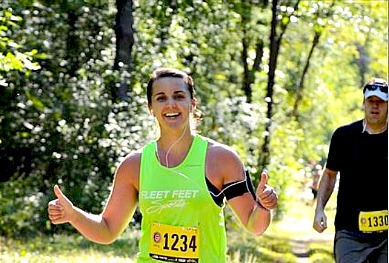 Dropping out of this race reminded me that running and being healthy is part of who I am. I was reminded that having the ability to run is a gift I am grateful for, and not something to take advantage of in order to prove to others what I was capable of. I was able to listen to my body to see that something wasn’t right in training, I wasn’t happy and I didn’t feel healthy in each run. This was a discouraging experience, but also one that I am thankful for, as I have regained my love for the sport, remembered the the joy it brings me, and ultimately became a stronger runner mentally. I encourage you to take a step back and always remember why you run, what is it that motivates you, and to enjoy every moment of it.